Here's what to check your fridge and freezer for. The latest listeria-related recall is a scary one: Being that it's summer right now—and that the recalled items are quintessential summer staples—there's a good chance they're lurking in quite a few refrigerators. According to the USDA, Altus, Oklahoma-based company Bar-S foods has recalled five chicken and pork hot dog and corn dog items that may be contaminated. 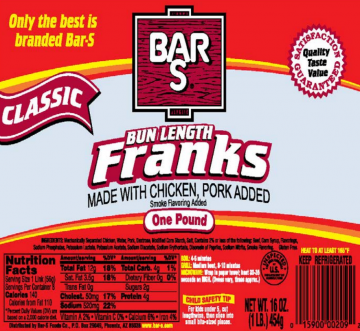 Bar-S has had listeria issues within the company, but test results for these particular products are pending. There have been no known reported cases of illness from these products, but it's important to note that pregnant women are at greater risk for developing listeriosis, the illness associated with listeria consumption. Symptoms tend to set in two to 30 days after exposure and can include headaches, nausea, fever and chills. Listeriosis can lead to premature delivery, miscarriage and even stillbirth. It can also lead to life-threatening infection of a newborn. If you have these items at home, throw them out or return them immediately. If you've already consumed one of the Bar-S products on the list above, consult a physician.